Small tapered Adjustable clear stream nozzle develops display with a minimum of distortion. Designed for precision use with spray ring, spray ring, spray bars or other installations where precision vertical columns or trajectory patterns are desired. A sparkling and unique triple – tiered effect of clear streams. Ideal for small and medium sized displays. No constant water level is required. 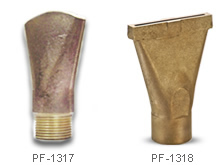 Cast bronze construction with Fix Jets removable cap for easy cleaning. Finger jet nozzle produces a delicate, arching spray pattern using precision clear stream jets. Combined with a main swivel connection permits a wide range of spray patterns and angles. 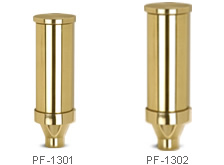 Due to the low noise and splash reduced, finger jets are ideal use in courtyard or entryway pools designed for close range viewing distance. Application includes indoor or shielded outdoor use in commercial institutional and municipal building and landscape projects as primary display features, or as peripheral accents to primary display features they are also used effectively in series or grouped in clusters. Machined brass and bronze construction. Female threaded connection. A Clear of water in the shade of a bell. Minimum sound or splash. For silence wind-free locations in small and medium sized displays. Ideal in grouping of various heights. No. Constant water level required. The “Aquascape” Fan Jet creates a particularly compact, Fan shaped water stream with a thickness of 6 mm. This type nozzle is especially attractive when arranged in a group around a center nozzle but even on its own this jet will always find its place in any arrangement. Cast bronze construction with thread connection. 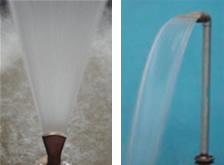 A column of Frothy, aerated water, Recommended for small and medium displays in shallow pools. Beautiful when lighted. Jet has low profile and neat appearance. No constant water level is required. Cast bronze and brass with internal air/water ration adjustment. Exterior is of Bronze.